Local businesses like Renosol continue to show their community spirit and dedication to improving the lives of those in need through a significant donation of food, personal needs and household items. All three shifts of the Renosol plant in Farwell coordinated a food drive that raised over 670 pounds of non-perishable food that will be used for Mid Michigan Community Action’s Emergency Food Pantry. Mid Michigan Community Action operates an emergency food pantry in Clare County which has been operating over capacity for over a year. As the economy has staggered the need for necessities has gone up. 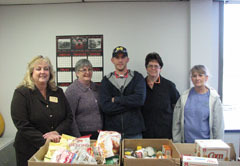 “We receive limited funding to operate the emergency pantry which makes donations like this so valuable,” Sutton said. Renosol Seating is a division of Lear.